The "urban repair squad" painted a pedestrian crosswalk during the Brazil - North Korea World Cup match. Photo via ApocolipseMotorizado. São Paulo, Brazil is notorious for its horrifically congested streets. The city has the world’s sixth most painful commute, and motorization in the metropolitan area of more than 19 million residents is growing by 10 percent per year. But just as São Paulo’s streets are certain to be gridlocked for hours during each day’s rush hour, they’re certain to be eerily empty during important mega-events like the World Cup. A group of bicycle and pedestrian activists took advantage of the carless streets during the games to paint zebra-style crosswalks and add other signage and warnings to the city’s woefully pedestrian-unfriendly streets. The do-it-yourself street makeovers are part of a growing worldwide trend to make streets more inviting to walkers and bikers…without waiting on local officials to initiate the work. In New York City, people recently painted “guerrilla bike lanes” and other street signage in Brooklyn, as Treehugger reported. And in Washington, D.C., street artist Steed Taylor and a group of volunteers gave the District’s downtown Vermont Avenue a “road tattoo,” which BeyondDC described as “an installation of pavement art that makes the space seem even less like a normal street and more a public plaza.” Other “Urban Repair Squads” from Los Angeles to London do their part to fix urban spaces. 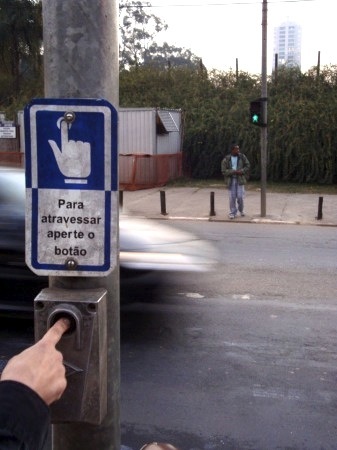 So it was only a matter of time before urban activists resorted to painting guerrilla crosswalks like these in Brazil. 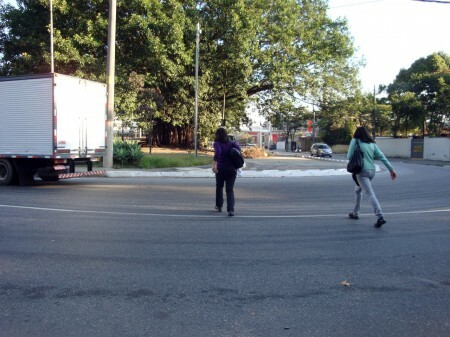 Before activists painted a makeshift crosswalk here, pedestrians had to cross this dangerous curve near the University of São Paulo. Photo via Apocolipse Motorizado. Fresh paint on the curve approaching the new crosswalk warns drivers: "Lives: Go Slowly." Photo via Apocolipse Motorizado. 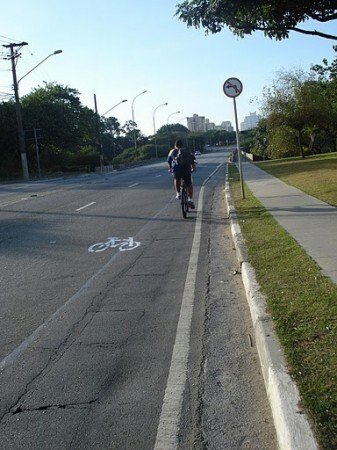 The Brazil-Ivory Coast match brought a new bike lane to Dr. Hugo Beolchi Avenue in the Jabaquara neighborhood. 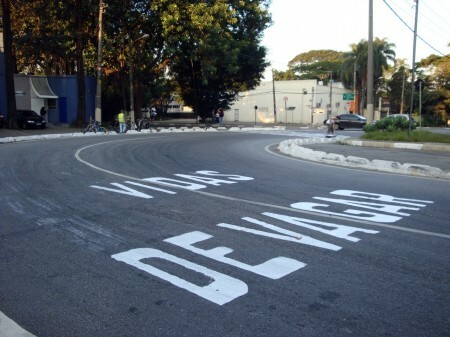 During the Brazil-Ivory Coast game, the Urban Repair Team painted new bicycle signs on Dr. Hugo Beolchi Avenue. Photo via Apocolipse Motorizado. A new crosswalk painted during the Brazil-Holland game, with the message "Game of Life." Photo via Apocolipse Motorizado. While arch-rival Argentina got trounced 4-0 by the German team, activists moved to a particularly dangerous Pelican (pedestrian light-controlled) crossing on Miguel Estéfano Avenue, in front of the Botanical Garden. The Pelican crossing was in place without any painted crosswalk or signage. This kind of crossing can put pedestrians’ lives at greater risk than none at all, since pedestrians trust the “Walk” signal, while cars have little or no warning that pedestrians are there. 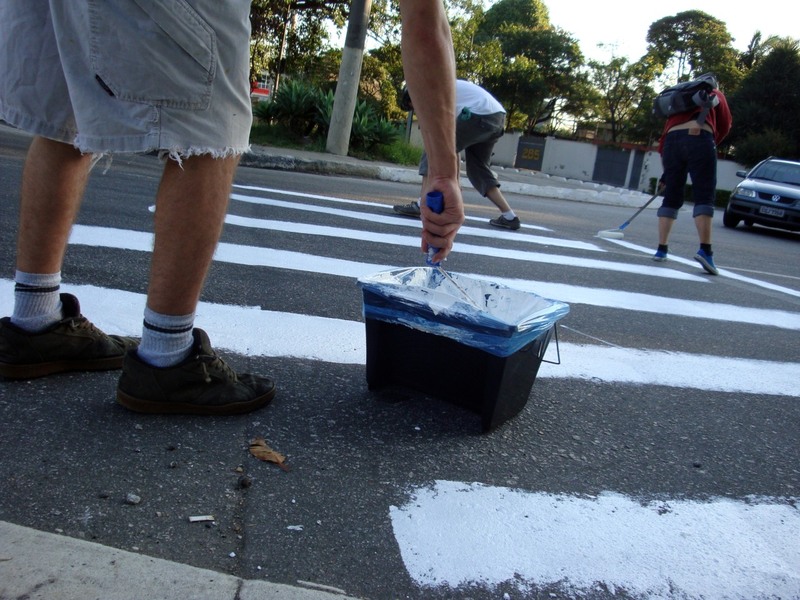 Activists painted giant white lines — a zebra crossing — that made the crossing much more visible to motorists. To see more photos of what the activists accomplished during each game, visit the website for Apocolipse Motorizado (Motorized Apocalypse). 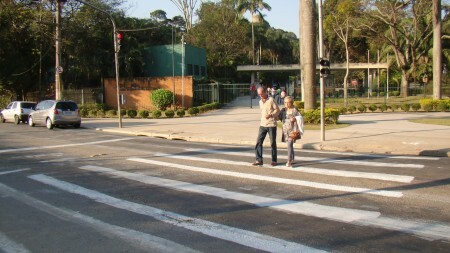 Before: A dangerous pelican crossing in front of the city's botanical gardens. Photo via Apocolipse Motorizado. After: Pedestrians use the Urban Repair Squad's new crosswalk at the pelican crossing. Photo via Apocolipse Motorizado.